We dispatch 24-hours a day, 7 days a week, 365 days a year! 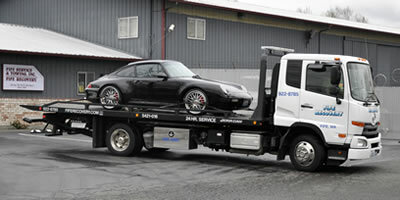 We offer fast, reliable 24-hour towing in Tacoma and the surrounding areas. As a locally-owned business since 1949, our certified towing professionals are well-trained and well-equipped for any type of towing or roadside assistance. Don't be kept waiting. We promise safe, dependable, fast service! We provide superior 24-7 commercial towing services in Tacoma and a large range of surrounding cities. Our impressive fleet of towing vehicles are capable of any type of commercial vehicle recovery. Our specially trained and certified towing professionals handle everything from load shifts and reloads to crane service. 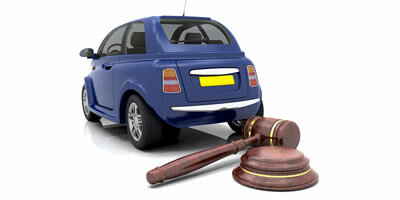 Car auctions are a great way to save money on your next vehicle. Fife Service & Towing frequently holds automobile auctions where you can bid on any vehicle you want. Find vehicles for rock-bottom prices you won't find anywhere else. Inventory changes all the time, so there is sure to be something for everyone! Choose affordable towing service and get moving! Having a breakdown is stressful enough. You don’t want to add long waits and unprofessional tow truck operators to your day. 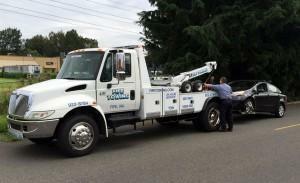 Fife Service & Towing offers safe, certified professional towing in Tacoma and the surrounding areas. All of our professional truck operators treat your vehicle like it was our own. We only charge affordable towing rates and offer complete roadside assistance. Our drivers respond to each call with care and respect for our customers. We treat you like a friend, and we get you where you need to go. We cover the entire Tacoma metro area. When you call us, we get to you quickly because we have a large fleet of towing vehicles available and a 24/7 dispatch. Our dispatch team works with you to get the right towing vehicle to you. That includes larger haulers like flatbed tow trucks and winch-equipped vehicles that can recover a semi-truck or trailer. We can get to you just about anywhere in the Greater Tacoma area, including surrounding cities in the area. 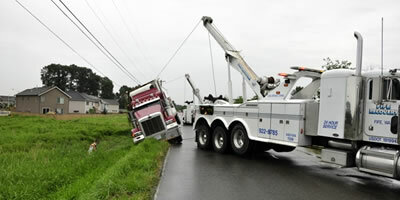 Get towing truck service wherever you are. We serve the entire Tacoma metro area. Our fleet is large. Don’t wait for the other guys to “finish up here.” Call us and get towing service now. We offer both residential towing services as well as commercial towing. No matter what you’re doing or where your vehicle has stopped, we can help. If you are locked out or out of gas, our towing service includes unlocking vehicles and gas delivery. We also do pull starts to get you back on the road. As a multi-generational towing company, we have expertise in just about any towing situation. We own the equipment necessary to get your vehicle off the road, out of a ditch, out of the mud, or just about any other imaginable circumstances. Our dispatch knows what questions to ask to ensure the right type of towing vehicle with the right equipment comes to your rescue quickly. The coverage you depend on. As a family-owned and operated towing and recovery company, we are the name in towing Tacoma drivers trusts. As the areas preferred towing company, we swiftly serve surrounding cities such as Des Moines, Federal Way, Lakewood, Seattle, and others. Since 1949, no other Tacoma towing company is as trustworthy as we are—our stellar references and reviews stand in testament of this! No one wants to be stranded alongside a road for long, this is why so many people choose us; the vast area we cover means rescue is soon on the way. Contact us today at (253) 292-6170 or toll-free at (800) 244-9528 for towing you can rely on. Ask about our discounts for senior citizens and military personnel! *Not for immediate/emergency service response. Please allow up to 48 hours for a representative to contact you. 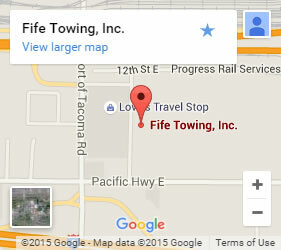 Fife Towing is a fourth generation “family-owned”, towing business with a reputation for excellence in the private and commercial sectors. We have been providing quality towing services in Washington, Oregon, Idaho and British Columbia since 1949. We have four locations around the Puget Sound area which are ready to assist by offering the most advanced expertise in towing, recovery, transporting services. Since 1949, we have remained a locally owned business in the Tacoma, Washington area. For 60 of those years, we have supplied the transportation industry with trained towing and recovery specialists, advanced equipment and diverse services to suit their needs. We’re proud of having one of the most versatile and sophisticated fleets in the Pacific Northwest and look forward to helping you. © 2019 Fife Service & Towing. All Rights Reserved.